The Tibetan Parliament-in-exile meets tomorrow and is expected to take up the declared wish of the Dalai Lama to relinquish his political powers. The deliberations assume significance because of the election of the ‘Tibetan Prime Minister’ slated for Sunday, March 20. 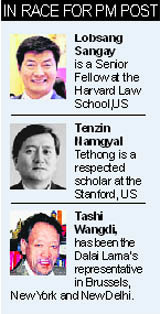 One of the candidates, Lobsang Sangay (43), is a Senior Fellow at the Harvard Law School while another candidate, Tenzin Namgyal Tethong is a respected scholar who teaches at Stanford while the third candidate, Tashi Wangdi, has been the Dalai Lama’s representative in Brussels, New York and New Delhi. The Dalai Lama’s announcement that he would like to retire from active politics and that political powers ought to be exercised by an ‘elected leader’ is interpreted to have been designed to send out the signal that his vision is that of a democratic Tibet, where there is no place for China’s one-party rule. The move is also designed to force Beijing to hold future negotiations with the ‘elected’ Tibetan Government-in-exile rather than the emissaries of the Dalai Lama. This would also rob China of any strategic advantage it might have secured by foisting a pliable man of its own choice as the next Dalai Lama. The Dalai Lama’s retirement plan may have stunned his flock but the move has set in motion a reform process and the eventual separation of the church from the state. Once the separation, as desired by the Dalai Lama, is endorsed by the Tibetan Parliament-in-exile, it would mark a sea change in the way Tibetans have looked upon governance so far.